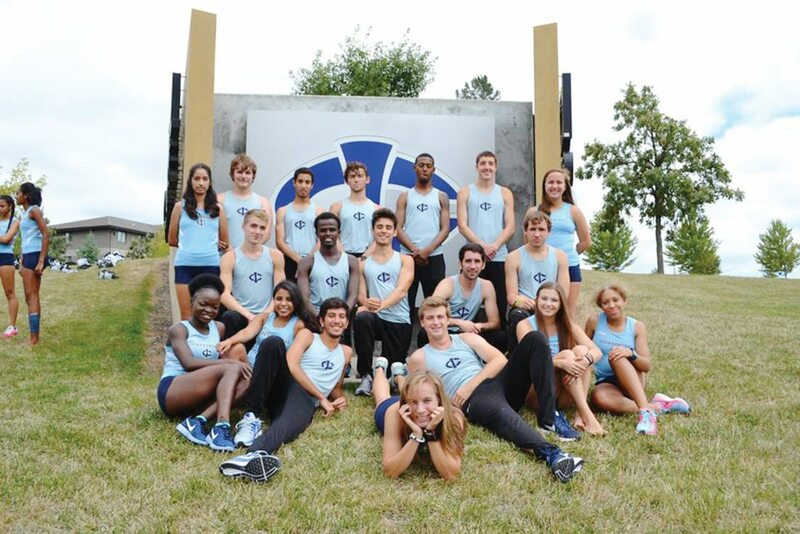 Submitted photo Iowa Central sophomores on the cross country team are (sitting in front): Agnes Mansaray, Jezabelle Rodriguez, Peter Eskandr, Katy Pfile, Josh Sunberg, Abby Gawthorp and Aaliyah Regg Wajid. Kneeling: Chris Wignall, Abdi Abdi, Grant Acoymo, Josh Jacques and Lane Prather. Standing: Naomi Alvarez, Ian Crowl, Karim Achengli, Romeo Blackburn, Alphonso Kitching, Mark Whalen and Sierra Stucky. If the opening time trials were any indication of what’s in store for the Iowa Central cross country teams, head coach Dee Brown has two strong groups on his hands. Brown is also looking forward to bringing the postseason to Fort Dodge later this year. “Hosting the regional and national meet is huge for us,” Brown said. “Our men and women will be able to showcase their talent in front of a home crowd with our fanbase. The Iowa Central women recorded a perfect score at the Region XI trials by taking each of the Top-5 individual times. The men also won the team crown. Freshman Adva Cohen claimed individual gold for the women, and Jhordan Ccope was the men’s champ. Mansaray was the runner-up on the women’s side, followed by Aaliyah Regg Wajid Abeba Sullivan and Marta Lukijaniuk. “We definitely have a talented bunch,” Brown said. “One of our top girls (Marion Bartilol) didn’t even run. We’ve had a great summer and have strong groups. The women are coming off a fourth place national finish, which saw a national individual champion Leanne Pompeani. Mansaray, who was the Tritons’ No. 2 runner last year, and Regg Wajid, who was the No. 3, return. Mansaray also won two indoor national track titles for the Tritons. Mansaray finished 19th at nationals, and Regg Wajid was 21st. Katy Pfile and Sierra Stucky also return. Cohen is the national record-holder in the steeplechase in Israel. Bartilol, who is from Kenya, also holds national records in the 600, 800, 5,000 and 10,000 in Sierra Leone. On the men’s side, the Tritons are coming off a runner-up national showing, where they placed three runners in the Top-10 and four in the Top-15. Sophomore Karim Achengli returns after a fourth-place national performance. Josh Jacques was the Tritons’ seventh runner last season. A number of other sophomores will also try to crack the starting seven. To start the season at time trials, Ezekiel Kipchirchir was runner up to Ccope. Innocent Murwanashyaka was fourth, while Abdinasir Abdi and Gemechu Meskele were ninth and 10th, respectively. Manson Northwest Webster’s Collin Bulten, Fort Dodge’s Ian Crowl and Jason Halverson, and Eagle Grove’s Dalton Schaffer are area runners. “The nice thing about the men’s team is that our No. 4 and No. 5 are talented freshmen,” Brown said. “There is an amazing group of sophomores that train hard and are just scratching the surface of where they will be. With a strict training regimen, Brown also enjoys the fact that the Tritons have a tough schedule to prepare them for the nationals. “We changed it up (schedule) a little bit. We start out slow to try to get them to transition from the 5k to the 8k,” Brown said. “We go to Iowa this weekend, and we’ll go to Michigan State and Oklahoma State. The Tritons will run at the Hawkeye Invitational in Iowa City on Friday. Sophomores — Naomi Alvarez, Rosemount, MN; Abby Gawthorp, Urbana, IL; Agnes Mansaray, Yeadon, PA; Katy Pfile, Katy, TX; Aaliyah Regg Wajid, Bronx, NY; Jezabelle Rodriguez, Eagle Pass, TX; Sierra Stucky, Plainview, MN. Freshmen — Marion Bartilol, Eldoret, Kenya; Adva Cohen, Jerusalem, Israel; Marta Lukijaniuk, Wroclaw, Poland; Abeba Sullivan, Saukville, WI. Sophomores — Abdinasir Abdi, Omaha, NE; Karim Achengli, Adra, Spain; Grant Acoymo, Ankeny; Romeo Blackburn, Amboy, IL; Collin Bulten, Manson; Ian Crowl, Fort Dodge; Peter Eskandr, Katy, TX; Joshua Jacques, Casselberry, FL; Alphonso Kitching, Detroit, MI; Mark Whalen, Dubuque; Chris Wignall, Ankeny. Freshmen — Dominique Bynum, Kansas City, MO; Jhordan Ccope, Huancayo, Peru; Zachary Emery, La Crescent, MN; Jason Halverson, Fort Dodge; Ezekiel Kipchirchir, Eldoret, Kenya; Gemechu Meskele, Minneapolis, MN; Abdul Mohamed, South Sioux City, NE; Innocent Murwanashyaka, Saint Paul, MN; Mel Obadiah, Cleveland, TN; Lane Prather, BC-IG; Dalton Schaffer, Clarion-Goldfield/Dows; Joshua Sunberg, Red Oak. Sept. 1 — at Hawkeye Invitational, 6 p.m.; 8 — at Yellow Jacket Invitational, 5:45 p.m.; 15 — at Michigan State Invitational, 12:15 p.m.; 30 — at Oklahoma State Jamboree, 8:35 a.m.
Oct. 14 — Jim Drews Invitational, 10:30 a.m.; 29 — Region XI Championships (Lakeside), 11 a.m..
Nov. 11 — NJCAA, national championships (Lakeside), 11 a.m.; 18 — Half marathon championships.